Good Turnout for this week - 19 players. I donked my way up to 5th, not a bad week, but I am so weak at my Razz. Next week is Limit Hold'em. Sorry, on work tilt right now, very busy!! Hope to get to play, but if I don't I am already signed up, so steal away! Limit HORSE tonight. Should be good times. I play in a couple of local live tournament series. One it pretty much all inclusive, we play 7 events over 5 months during the winter, and the Top 20 get to play in a final Tournament of Champions. We have played two already, with me getting a 11th place in the first one, and finishing way to badly to speak of in the 2nd one. I currently am tied for 20th though, so I just need to improve my play a little (it really has a bit of a turbo feel to it, with small stack and 25 minute blinds.) The other is a World Series touranment series, in which the winner gets to represent the other 19 players at the main event. (And everyone gets about 4%, with the winner getting about 10% for playing for us). Last year's winner ended up finishing in the top 300, so I made more then enough to pay for this year. I had a nice 6th place finish in the first tournament, and the 2nd tournament was this Friday. I took an early hit when my set got rivered by a flush, and with more then 50% of my stack gone before the first blind was up, I decided to play a little more aggressive, managing to get back up above my start stack with turned straights on consecutive hands. I slowly got blinded down, and figured I would be out with 13 people left. I picked my spots and made timely folds and once we were down to 8 I managed to work from my 250 chip stack to 2250, but eventually lost when my pockets 2's were less then KQ when a King flopped. My 7th place finish puts me 4th overall after two tournaments, and very much alive at this point. The cashers were all among the top 8 in earnings on the Skillz Game Leaderboard, so I guess these guys really do know their stuff! I went out early in the Bodonkey when my flopped bottom set was no good against a flopped straight. Next weeks Skillz Game - Limit H.O.R.S.E. After a nice 5th place finish in a 171 man MTT in Omaha over the weekend, I feel good about my chances in this one! Who wants to come prove me wrong? 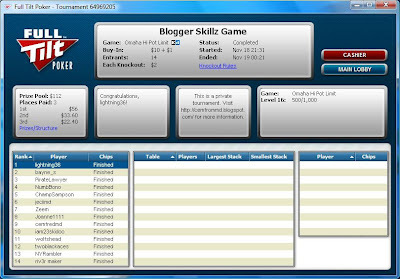 Updated Skillz Game Leaderboard - Dont forget Bodonkey Tonight! Nice little turn out for 7 Card Stud Hi-Lo. One of these days I am going to finish better then 5th place in one of these (mostly like the day only 4 people play). 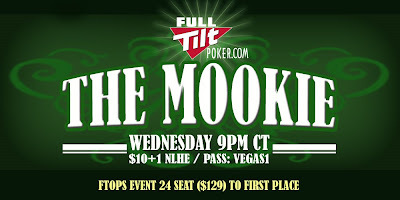 Next week will be Pot Limit Ohama Hi! Reading how Waffles won both the Bodonkey and the Skillz game on his blog and I find out in the comments that there may have been a chop between him and Pirate Lawyer, so I will be updating the Leaderboard later today. I managed to donk out of my own tournament in 5th place, love with the blinds are 1/6 of my stack. I did get another cash/points finish by finishing in 4th place in the Bodonkey, hopefully putting me back in the Top 15% there, and earning me enough cash between my two cashes that I can pay for all my buy-ins for the entire Bodonkey series, so this is EV+ now for me! I will almost certainly be late, as I have bowling and a much further drive home now on Tuesdays (like you all really need to know that). Dont forget the Bodonkey also. After my 3rd place finish in the Bodonkey the 1st tournament, it has been all downhill for me. The 2nd and 3rd tournaments I finished in the middle of the field, nothing much to note, just didnt get hands and probably was too passive on the hands I did get. Last night however I was shown the door in 24th place of 25. I started very tight, and had only played 2 hands in the first 16, when I was given pocket Aces. I potted my bet, which was reraised by the chip leader (who had knocked out the first person from the tournament). I figured on one of two things, trying to bully early with his big stack, or he actually had QQ or KK. My 2nd read was right, and as I pushed he instacalled with KK. A K on the 1st card of the flop, and I am sent hope as a 90%+ favorite preflop. Small turnout yesterday, with only 6 players. Between it being Election Night and the Bodonkey going on, it was slim pickings. I think Full Tilt expected lower amount of players last night, as they were offering Triple Full Tilt Points after 6 PM last night. Nice long tournament though, as it still lasted 2 1/2 hours, and I lasted almost 2 hours even though I finished 5th. Play this and the Bodonkey tonight! I will be playing both, but will be late, so grab my blinded off chips while you can!